We're coming into the end of another week. Since Copenhagen is inspired by real events and it's characters were real people, it has generated a lot of interest and discussion related to Heisenberg, Niels Bohr, and Margrethe Bohr. The play also touches on almost every major development in atomic theory in the first half of the 20th Century. You don't need to know all this stuff to enjoy the play, but some people may want more background. The play itself has a considerable post-script where the author goes into more discussion of the people and some of the history of the development of quantum theory. The play itself is not intended to be strictly non-fiction. While the play is based on real events and people, and the author has done considerable work to present the theories and events clearly, Michael Frayn has taken considerable license in giving these characters voices within the context of the play. Frayn appeals to Thucydides who explains in History of the Peloponnesian War that "I have made each orator speak as, in my opinion, he would have done in the circumstances." At any rate, plays and movies based on real events often arouse interest in their subject matter. To that end, here is a link to some collected resources on the play from MIT. It provides some very good background on the principals, plus the many people mentioned and of course some about the physics itself. So What's The Play About? We're very excited about Copenhagen. People often ask "what's the play about?" A natural question but for this play I think the simplest answer is a rather esoteric one: uncertainty. 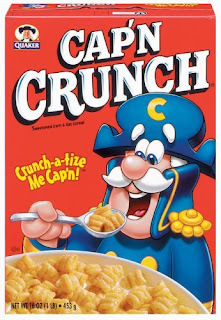 However, when re-reading the post script (this play has a 50 plus page post-script) I was reminded that while Heisenberg's theory is known as the "uncertainty principle" in English, in a way that's not the right word. Heisenberg's original paper referred to Unsicherheit which means "unsureness." The actual concept is closer to "indefinability" or "unknowableness." The English word "uncertainty" implies the existence of a true value, an objective truth of which you have an incomplete understanding or measure. But that's really not it. 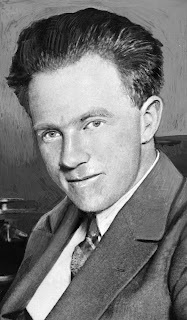 Heisenberg's theory is often misunderstood as a measurement problem. We just don't have instruments sensitive enough to measure things correctly, but if you could some how be a super teeny tiny quantum sized observer you could see what is going on (never mind that you couldn't see anything because you'd be smaller than a photon... but you get the idea as a thought)... that there is a knowable "something going on" but we just can't see it. What Heisenberg's theory actually implies that there IS NO objective truth. Or perhaps, the thought that there is one isn't useful to us. It's a fundamental aspect of nature that there is no objective definite answer. In fact, (and this is the cool and strange part) you can quantify and define your inability to quantify and define! It's weird and a bit mind blowing but the truth is that at a certain degree of specificity there is no objective truth. There's no "there there." Basically to me this is what the play is about, writ large. That is, Heisenberg discovered a fundamental feature of the quantum atom, that some things are not just difficult to know, that they have a certain definable characteristic of unknowableness. The play takes this idea and expands it to our lives. That history, memory, and even our own motivations have some of this element of mystery. The point (as I see it) is that ultimately in a search for truth the greater truth is that there IS no truth; no objective, observable universe; no single correct explanation of a behavior or phenomenon; that knowledge is the collection of possibilities, not the elimination of them. South Stream is thankful for friends. So many people already have helped to make this show a reality. Really it's hard to overstate how much work goes into even a tiny show like ours, and these types of shows simply wouldn't be possible without a bunch of friends pitching in. We're taking a break for Thanksgiving, but we've had a great start to the production thus far. First, we welcomed Todd Houseknecht as our lighting designer. Todd has previously worked at NRACT, RLT and Cary Players, so we're very happy to have him on board. Second, with a bit more than a week of rehearsal under our belt we've gotten Act 1 blocked and managed to run through it Thursday night. I have to say it looked pretty good considering we're more than a month from opening. This weekend we were busy with other work on the show. Saturday morning Patrick Campbell and Jason Bailey (a.k.a. "Altercation Pictures") did the outdoor shoot for the trailer (yes! we'll have a trailer for "Copenhagen" fancy!). It's going to look great. Sunday afternoon Todd and I visited the "West End," our venue at The ArtsCenter in Carrboro. We looked at the space and discussed ideas for lighting the stage in the round. It's so great to have Todd on board. I know which end of the light to point at the actors, but that's about it. The ArtsCenter will be our second weekend venue, so having a plan developed before we have to load in will go SO far in making sure we have a smooth transition. 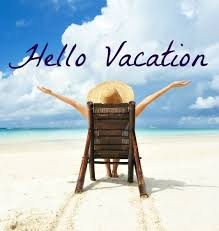 Now the actors have a week off to learn lines and eat turkey. Don't forget about our kickstarter! We're a bit more than 20% to our goal! We need your help to make this happen. Get your tickets early! Big news: today we're launching our Kickstarter campaign for Copenhagen! If you're considering going to the show, please go over to our Kickstarter page and pledge. If you pledge $15 you get a ticket... which will be the ticket price at the door. You save service charges and you get a ticket in advance. If you can't make it but you want to help out the show, or if you want to give a little extra in addition to the ticket price, we'll give you a thank you in the program. This is a great opportunity for us to presell some tickets and make sure we have enough money to cover our costs. We can't do this without you! We have show dates, we have showtimes, we have an awesome poster, we have a facebook event! Check it out and let us know you're coming! Also, please like South Stream on facebook. We like you we promise. Here's the show poster for Copenhagen. Pretty boss right? Amazing work by Daniel McCord. The background image are traces left by subatomic particles in a bubble chamber. 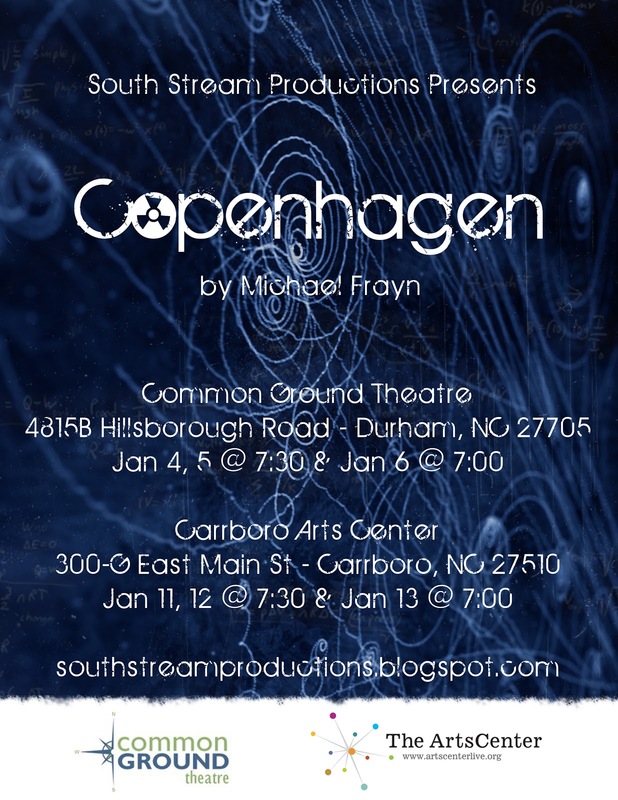 South Stream Productions will be producing the play Copenhagen by Michael Frayn Jan 4-6 at Common Ground and Jan 11-13 at the Carrboro Arts Center! 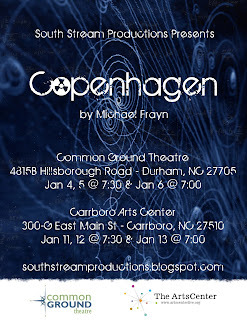 Copenhagen is an intense drama that focuses around Niels Bohr, his wife Margrethe Bohr and Werner Heisenberg. 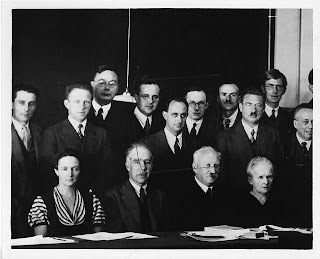 It centers on a real visit Heisenberg made to the Bohrs in Copenhagen in 1941, at the height of World War II and a conversation that took place there, and the subsequent historical controversy of its meaning. The characters now "dead and gone" return to those events to revisit and explore that conversation and the very idea of memory and truth. Welcome to South Stream Productions interweb site. We're here on blogger because it's wonderful user interface and custom design features. Oh, and it's free. Did we mention free? South Stream Productions is a group of actors who want to do theatre in the triangle area that we think is interesting, engaging and entertaining... but most of all "fun stuff we want to do." We're not doing this for money (well, you do have to buy tickets, but trust me, we're NOT doing this for the money). We're doing this because we find stories we like, that we'd like to tell and we think we'd be good people to tell them. Characters we'd like to play, shows we'd like to direct. That's it. So come join us.